Introducing the PMC-1 Pulse-to-Modbus Converter, the latest specialty KYZ Pulse metering device from Solid State Instruments. Gain access to a building’s energy use and demand information. Energy efficiency experts, use the PMC-1 to collect real-time energy and demand data directly. This data can then be used in your own software applications, web clients, or energy management and information systems. Demand response teams, with the PMC-1 you can monitor and verify the reduction of customers’ demand during control periods, or generate interval demand data for analysis. Utility meter technicians, instead of using expensive Ethernet-enabled meters as a data acquisition terminal, the PMC-1 can interface with any pulse meter and an Ethernet connection at a much lower cost. The PMC-1 Pulse-to-Modbus Converter reads, records, and stores pulses from two 2-Wire KY pulse inputs, providing access to energy use and demand information using the Modbus TCP protocol. The PMC-1 receives and converts pulses from the meter to kWh, in addition to collecting and converting instantaneous, average, and peak demand (kW). This information can then be accessed using a RJ-45 Ethernet network connection. The Modbus TCP protocol allows access to your PMC-1 using a unique IP address, which is programmed using a RS-232C DB9 serial port. 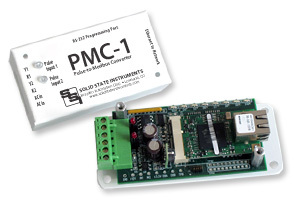 Using a PMC-1 Pulse-to-Modbus Converter greatly streamlines the implementation of power monitoring. No Current Transformers or Watthour Transducers to worry about. Just use a standard pulse output from any equipped electric, gas, or water meter and begin reading real time and historical energy use information immediately. Using Modbus TCP standardizes the process and makes gathering this information a snap!